UPDATE: We sadly lost Dreamweaver in August 2015. His progeny remains here in the farm in the form of his daughters who will pass along his fabulous fiber .... we miss him terribly. The 2012 DREAM GIRLS have arrived !!! ... yes that's what I said... GIRL GIRLS GIRLS. 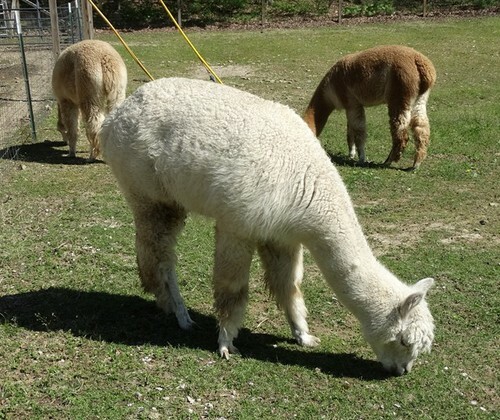 Dreamweaver has sired 5 GIRLS out of 6 cria so far. This year's group is looking fabulous and include a Med. Brown out of a Med Brown Dam, A Beige out of a Dark Brown Dam, A White out of a Light Fawn Dam ! One of only 6 male offspring in the US out of Victor's HemiAccoyo Americano, a prominent herdsire in Canada and out of the famed Timberland HemiAccoyo Breeding program. Only 4 of those US offsping are WHITE. 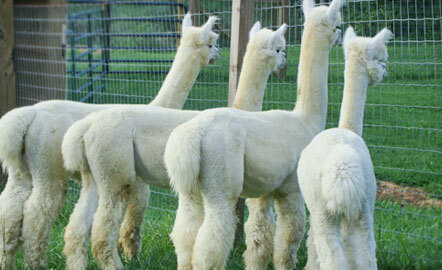 Until early 2011 Americano was exclusive to Agassiz's Alpacas and not available for outside breedings. Most of his female offspring and several select males have been retained by Agassiz's. So we are very fortunate to have purchased Agassiz's Sonatina with Dreamweaver in utero ! As the son of Victor's Hemi-Accoyo Americano his ancestry boasts the names of pPeruvian Vicotor and Peruvian Hemingway. On his dams side he has Light Fawn and White ancestors including a double Peruvian Guellermo (paternal greatgrandsire & maternal great-great grandsire ) and Pperuvian Leon. ! 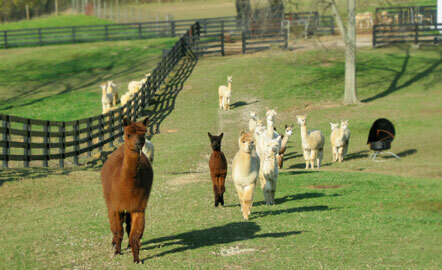 a 'who's who' of the North American alpaca industry. All of whom are known for the quality, consistency and award-winning ability of their offspring. What a line up of genetics ! Judith is a proven dam with nice density and fleece character that we obtained in Spring of 2010. 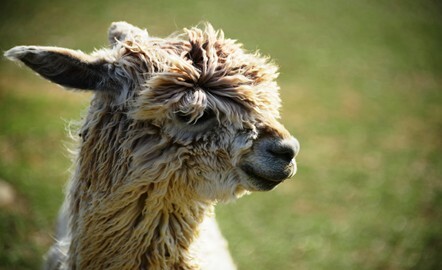 She was open when we got her and was bred to our Americano's Dreamweaver for a 2011 cria. 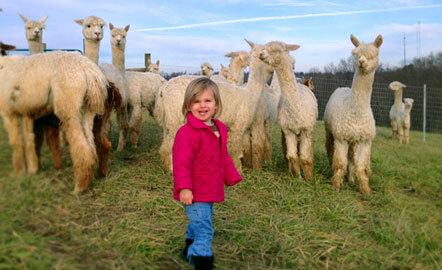 She carried that cria for 1 full year before effortlessly giving birth on June 2, 2011 to a healthy 16 lb white female, Dreamweaver's Alianorah. 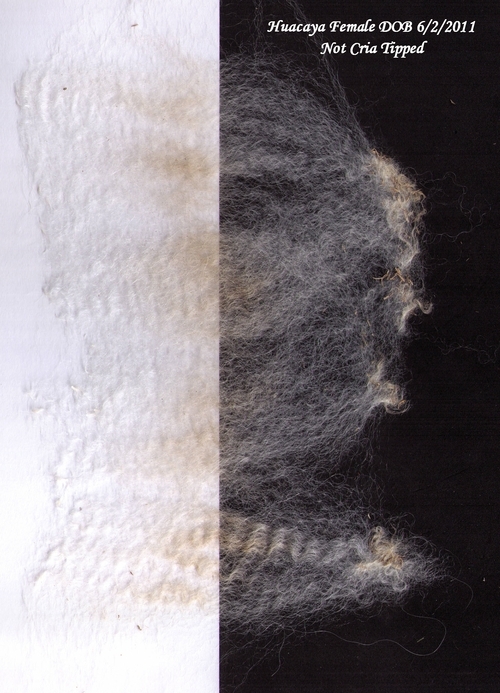 Judith's fiber is very soft and has a nice handle to it. 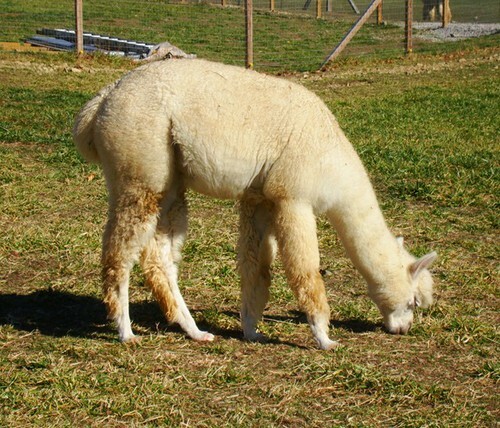 Judith has had one cria, a white male, for her previous owners where she was used sparingly in their breeding program. Judith has an interesting heritage on her ARI with ancestors from Canada, New Zealand, Australia and Chile ! Also many ancestors of color including Medium Rose Grey, Medium Brown and white. 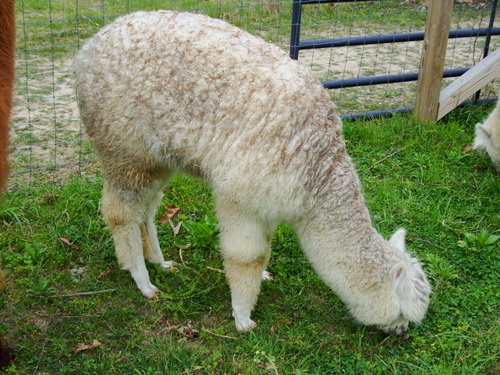 Her Dam, who is white, has produced color when bred to color including Medium Rose Grey when bred to Medium Brown and Dark Silver Grey when bred to True Black. 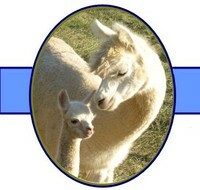 Judith is an excellent mother providing an abundance of milk for her cria. We were not sure what to expect from her, but we are very pleased with her mothering skills and the quality of her milk production. 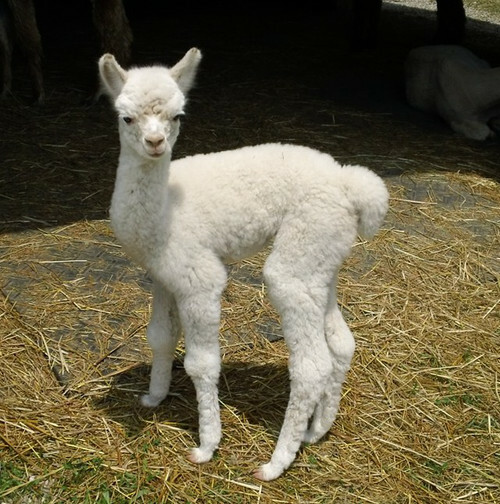 Her cria consistently gain weight and Judith weans them herselft at approximately 7 months of age. 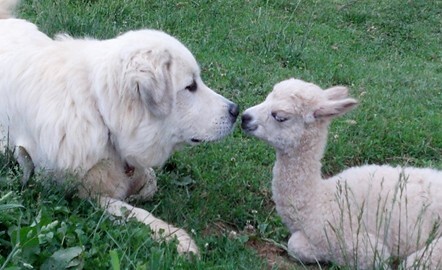 Judith is a calm and easy going mom and does not mind if we mess with the cria. 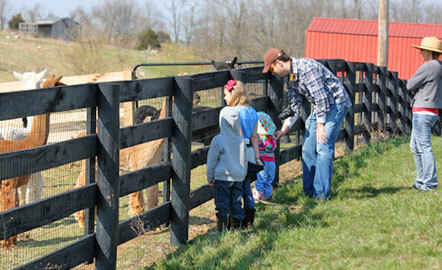 She has even been seen allowing other cria to nurse from her and also two at a time while holding great body condition. Judith's 2010 blanket was blended with Jemma's (med fawn) for a lovely yarn shown here. On July 18 Judith gave birth to a 19.9 lb light male sired by Tri-Star's Tavio of KVR. Judith comes with a breeding to any of our wholly owned herdsires. 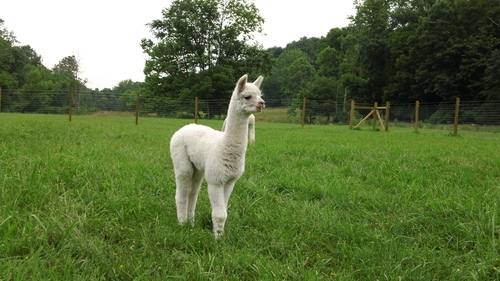 Alianorah is the first cria from our Americano's Dreamweaver. She has grown into a nice young lady with perfect conformation and ample fleece. Norah has great bone structure and posture. 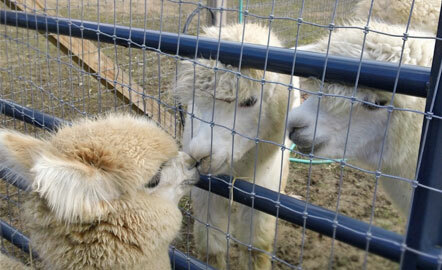 She still has that young lady attitude and is very curious and somewhat playfull with the cria. She has a mild mannered disposition too ! Her fiber has great staple length, the longest on the farm for the last two years. Nora sells with no breedings or reproduction guarantees. All transportation costs are the responsibility of the buyer.